“Pilgrim Spokes: Cycling East Across America” by Neil M. Hanson was a fantastic surprise. Usually I find memoirs from independent authors are a bit of a mixed bag. Generally speaking, they cover interesting events that the author experiences; for example, exciting times in history. They are also often poorly written, or if they are well written, lack any reason to be interesting. Worse, some are poorly written and have no particularly interesting or meaningful topic to comment on. “Pilgrim Spokes” however, does not have this problem. From the very first page, you can tell the author is an excellent storyteller who knows how to pull the reader into the story. Hanson crafts moments with words that read like memories in a very stream-of-consciousness style. The writing style allows you to feel like a participant in the event rather than simply someone reading about a recollection of past events. “Pilgrim Spokes” though technically a memoir, reads more like a traditional story. There is a lot I like here; it's not just that Neil writes well. Instead of focusing on himself, he focuses on places, people, and relationships, and all of them are crafted into real, tactical things through his writing. Unlike so many other writers who simply follow a template of writing without creating characters, setting, or any real meaning, Hanson turns everyday activities like stopping for breakfast into meaningful moments by focusing on everyone except himself. The real secret here is that the book is not really a memoir as much as it is a documentary of American life east of Kansas. Neil uses himself as a backdrop to tell amazing stories about his encounters along the road. There is a decent amount of cycle jargon, which I am not qualified to speak on, as I am not a cyclist. I personally found it informative and interesting but whether an actual cyclist would or not, I cannot say. 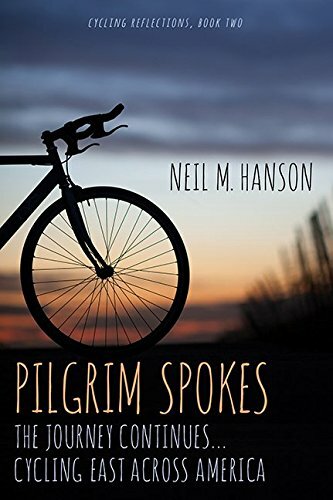 In the end, I found “Pilgrim Spokes: Cycling East Across America” by Neil M. Hanson to be one of the most enjoyable books I have reviewed this year and I give it four out of five stars. It is hard to find anything wrong with this book. It is long and the second book in a series. The font is small and the chapters are solid; the author clearly was not trying to write a quick read or your typical $1.99 e-book. Be prepared—this might be one of those books you read with a couple books in between or on a really long road trip. It is an excellent read well worth the time if you have it. Just know what you are getting into and that if you do get into it, you won't regret it.